i recently decided to upgrade my ram from 8gb to 16gb. because i didn’t know exactly what i had installed, so i opened my pc and pulled it out. after putting it back in, my pc wouldn’t start. the fans would spin up, but no display output or anything. after some research i cleared the CMOS. after that it would output 1 long beep and then two short, but still nothing on my monitor. i reseated the ram, hoping that it would solve it. in a way, it did. now my pc gets to the splash screen, but halfway through the animation it freezes, and for a brief moment shows a blue screen (picture: http://imgur.com/XNMDosp). i have tried everything windows tells me to, but with no succes. i have tried booting linux from a usb which worked perfectly. i have now received my new ram, and switched it out with my old but there's no difference. Would it work if i bought a 2,5’’ harddrive cover and copied the data to my laptop, reinstalled windows to my ssd, and transferred my user data back? memtest86+ is the gold standard for testing ram. You can download the program which does not need aos to a usb stick and test. Try one stick at a time. Some motherboards are picky about which slots less than a full complement of ram should be installed. In getting mismatched sticks to work, sometimes adding a bit of extra voltage helps. That assumes you can enter your bios at all. Some motherboards can be very sensitive to this. If you bought two 4gb sticks, they are not guaranteed to work together. You should buy a 2 x 4gb kit which will cost slightly more. Go to the Kingston ram upgrade app and enter your motherboard. You will get a list of supported Kingston ram kits. If at the end, the ram tests out ok with memtest, I can only assume that something is wrong with your current state of windows. Run memtest86+ on each stick individually mounted in slot A2. That is where ASUS recommends a single stick be installed. That will verify that each individual stick is good. If all pass, then mount two sticks in A2 and B2 Your new 2 x 4gb kit would be best to test. You should get NO errors for a full pass. The manual is silent on where to mount 3 sticks. But, to get dual channel operation, mount your single 8gb stick in one channel and the other two 4gb sticks in the other channel. Otherwise only the lower capacity channel will operate in dual channel mode. And... since you have 3 sticks, up the ram voltage via the ram section of the bios. and how much do you think i should up the voltage? You realize that 0x0000007B has nothing to do with a memory issue? Set your SATA controller to its original mode (probably IDE) and the system will boot. Then let us know if you want to change it to AHCI and we'll provide instructions, but first let us know what version of Windows you have. You definitely changed something; otherwise it wouldn't crash with that error. Try AHCI and RAID. i changed it to to RAID and now it boots normally, but only with 2x 4gb installed. so what i'm asking for is what would be the best setup with the ram i have? You had the SATA controller in RAID mode which isn't an issue. It's impossible for all modules to be identical if two are 4GB and one is 8GB. Buy a compatible 16GB kit and be done with it. None of your posts provides info about the modules; all we know is that they run at 1866 MHz. 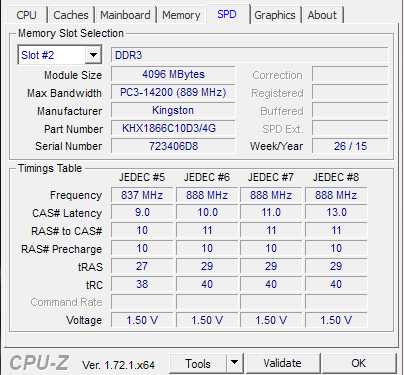 DDR memory runs at twice the clock speed. 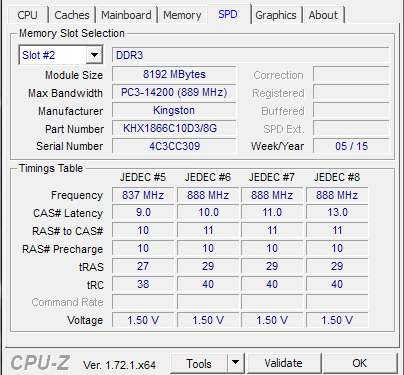 If CPU-Z reports 933 MHz, then they actually run at 933 x 2 = 1866 MHz. If unsure, check what speed they run with CPU-Z or in the BIOS. 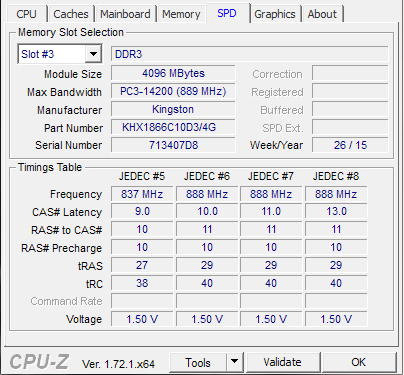 You could also use CPU-Z to check the part number of each module and post that info. We could possibly suggest settings that could work, but expect lower performance and instability issues with your different modules. Increasing voltage may help, but I wouldn't recommend that solution until you provide info about your modules (speed, timings, part numbers and voltage). Manually set the frequency to 1600 MHz in the BIOS (it will be displayed as 800 MHz in the Memory tab) and then add the new module. It may work, but no guarantee. Using 3 modules also means that the new memory operates in single channel mode. ADD the 8gb stick while my pc is running? And can i set it to 1866mhz? Certainly not. Set the frequency and power down the system, then add the new module. You already know that it doesn't work at 1866 MHz. And not upping the voltage? And in which slots should i place them? Leave the 2 x 4 GB kit in the original slots (probably DIMM A1 and B1) and then install the 8 GB module in one of the other slots (you can try both but try A2 first). Doesn't Asus explain in the manual what slots should be used? If you want to increase voltage then do it, but don't exceed 1.65V. Then install the kit in A2 and B2 and the single module in B1. This is mwhite1765 here and i recently joined this forum. I heard that you noticed Blue Screen After RAM upgrade. Coincidentally I'm affiliated with product 1-Click Fix Utilities. I have a link there below that you can click on to Fix Any Computer Problem including your RAM upgrade issues. You must also clear your cookies before you click on that link. If you don't know how to clear your cookies, just click on this link for instructions.